GA! : Melissa, you always seem so happy-why is that? Melissa: It is easy to be happy when you are in the right place at the right time with the right people. I love being a part of the William Henry team! GA! Tell us a little about yourself, and how long you have been with William Henry? Melissa: I am newlywed and a proud mother of a handsome 3 year old. 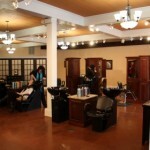 I have been with William Henry for 5 years, and I am the Salon Manager here. GA! The Belmont location has really done well, and now with the Mt. Holly location open- it must be exciting to be with a company that is growing! Melissa: It is super exciting! It has been such an amazing experience to be a part of the management team as we have strengthened our business and added services all along the way. GA! Obviously, there are other salons, what is your “secret to success”? Melissa: I feel like William Henry changes lives. We have such a diverse team of talented professionals that are committed to bringing about the renewed results that our clients are looking for, in a relaxing environment, with refreshing personalities. I want to make sure that our guests leave with not only the desired new look, but a great experience! GA! What is new in the salon world-are there new looks or products that are cutting edge? Melissa: The latest color trend is the “rooty” look. Who would have ever thought that roots could look so fabulous?! Another great service that has been added to our menu this year is the Keratin Complex Treatment. It does wonders for unruly curly hair. As the demand is rapidly increasing, we have worked hard to make sure that we are carrying the top lines of natural and “vegan” products. GA! 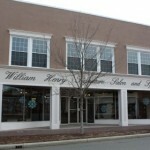 This is William Henry’s second location. Are there any plans for expansion or growth you can share with us? Melissa: Isn’t it amazing! It is such a beautiful atmosphere. I love the nail spa! We are so excited to be a part of the wonderful change and energy that is coming to Mt Holly! GA! 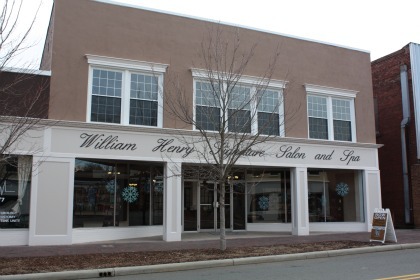 Why do folks choose William Henry? Melissa: It is Heaven on Earth! We have both men and women clients that come and spend the better part of their day with us indulging in all of the wonderful services that we provide in our salons and spa. 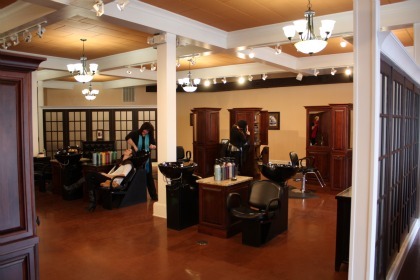 Above and beyond all of our hair services, both of our salons have the finest nail spas in our area, not to mention all of the spa services that we offer in our Belmont location.